Its name creates the illusion that this lighthouse is also situated near Cape Town, but it is actually located in the Eastern Cape province and is often referred to as the Port St Johns Lighthouse. 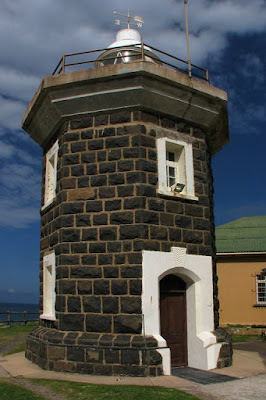 According to Lighthouses.co.za the Cape Hermes Lighthouse did not start out as the octagonal tower structure it is today. Apparently, when it was commissioned in May 1902, it consisted only of a ships masthead light hanging outside the signal station. The lighthouse, as it stands behind its picket fence today, came into operation about two years later - on 16 October 1904. NOTE: Researching this lighthouse, has definitely secured a position for Port St Johns (aka the Jewel of the Wild Coast) on my destination bucket list. After two weeks off on "puppy maternity" I'm back at work with a heavy heart and sagging spirits. My job isn't that bad, but work is still work, man. Anyway, take a few minutes to listen to this so that you too can feel terrible about having to be at work. On a Monday. This week's Lighthouse adventure takes us back to the future, so to speak. 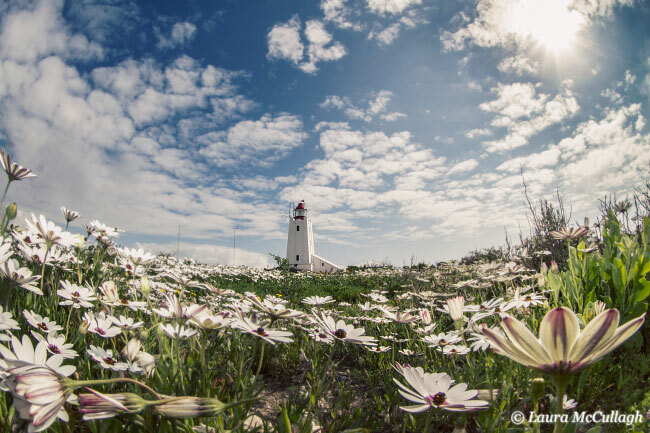 In contrast to Cape Agulhas, the second oldest working lighthouse in South Africa today, the Cape Columbine Lighthouse was only commissioned on 1 October 1936, which means that for a lighthouse it is quite young. However, being more than 60 years old, it is still protected under the National Heritage Resources Act 25 of 1999. 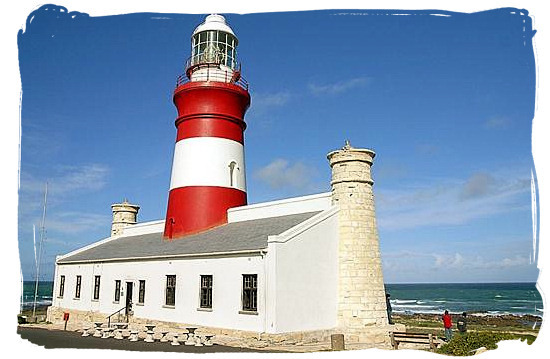 This lighthouse is the first South Africna lighthouse you'll spot when travelling by sea from South America or Europe, and it was named after the barque Columbine*, which wrecked just north of its location in 1829. Haven't I mentioned how much I love Lonely Island yet? My quest, as charity should, starts at home, so please allow me to introduce you to our first subject - the Cape Agulhas Ligthouse. It was commissioned in March 1849, and today it is the second oldest working lighthouse in South Africa, albeit only the third of 23 built down here. This lighthouse stands VERY close to our country's most southern tip (only about 1.2 km), where the coastline became a graveyard of shipwrecks. The sea off Cape Agulhas was notorious with sailors for winter storms and massive rogue waves, and many large ships perished there* (ref: SafariNow). After the intense South African heatwave last week, I think this song is more than fitting today. I am altogether smitten with lighthouses. Our love affair has been dragged around with me from the very first time that I saw one. Oddly enough, although it was love at first sight, I cannot remember when I saw my first lighthouse. I just know, in my heart, that I've always felt that way. A similar observation can be made about my faith - I don't know when I started believing, I just know that I do. 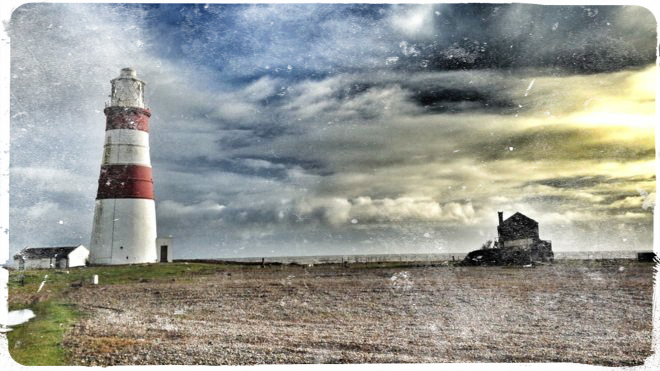 Whatever the reason, I couldn't think of a better way to end each week, than by incorporating this long standing love relationship with lighthouses in a new regular post. 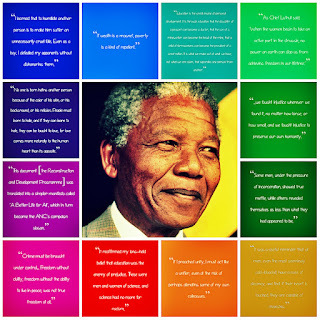 As it happened, we planned a Soweto tour as our Company's Year End Function activity in 2013, and shortly after making our booking, Madiba passed away. It was a moving time for many in our nation, and on our visit to the Hector Pieterson Museum, I saw this book in the souvenir shop and immediately bought myself a copy. At over 700 pages, it took me two years to read it. Mainly because I left it on my nightstand to gather dust for the first 23 months before scraping together the courage to open it. It's not your usual Holiday read, but I finally had enough time on my hands to delve into this big book. My sincerest apologies! 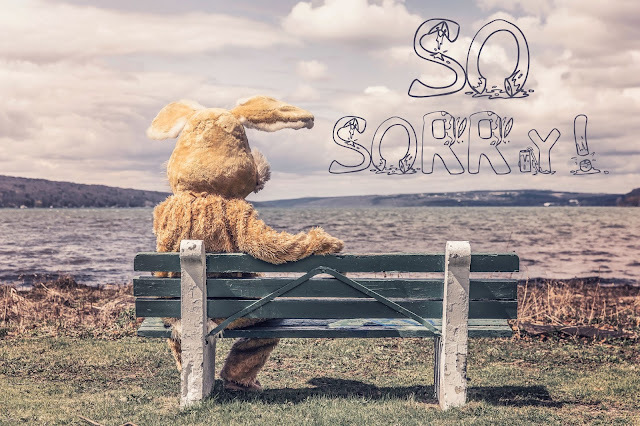 Being back at work - opposed to playing with our new puppies - is much harder than I thought it would be, and I completely forgot to publish my usual Weird Musical Monday post. Despite battling an unexpected summer cold, my 2015 ended on a mushy, comfortable high. Yesterday afternoon I surrendered to a surge of inspiration and we rearranged the lounge furniture for about an hour. After numerous tries, we finally got it just right, but our nerdy satisfaction didn't end there. We then went to visit Lucy & Lilly*, ordered a take-away roadhouse dinner, and settled in with Pan's Labyrinth to ring in the New Year. 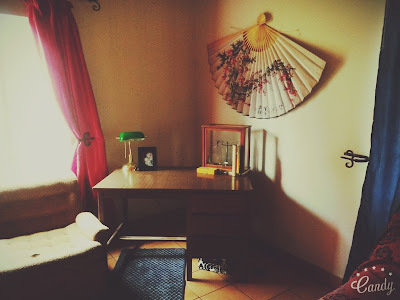 I hope this feeling of utter contentment lasts throughout most of 2016, and that the new writing nook will spurt forth a wealth of creativity. *Their mother died last week - due to the owners' shameful neglect. They were only about three or four weeks old. Luckily we have a wonderful surrogate mother within our circle of human friends and all six pups are doing very well, but we feel that these two are still too small to leave their siblings to come home with us. We'll give them another week or so.